The 1870’s were a time of change for both Helen and Caroline. Following the death of Helen’s father, Rev John Ekin, both Helen and William went through a fundamental change in their religious views. They were both highly intelligent individuals who used their status and education to bring about social change—mainly with education and women’s rights. Deeply influenced by the Transcendentalist authors, poets, and philosophers like Henry David Thoreau and Ralph Waldo Emerson, William no longer felt like he could conscientiously continue his duties at the pulpit. 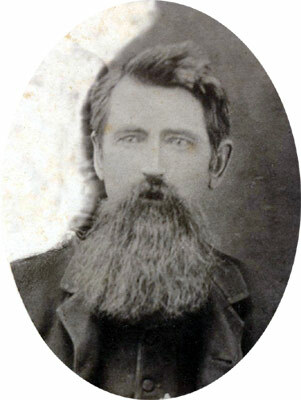 In 1870, Reverend W.A. Starrett resigned from the Presbyterian Church and began to study law. 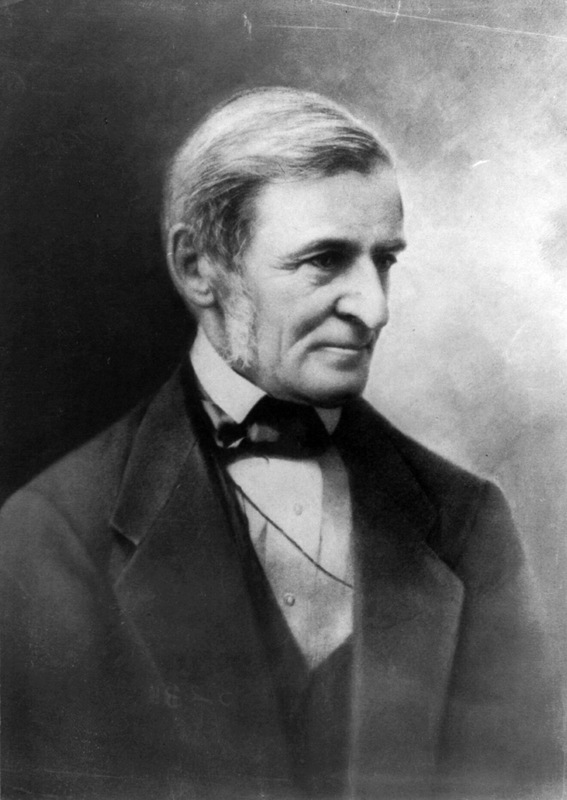 Writer Ralph Waldo Emerson’s essays had a profound effect on both Helen and William. It was Emerson’s influence that sparked their decision to convert to Unitarianism. according to their daughter, Helen Starrett Dinwiddie, her parents could quote Emerson as easily as they could the Bible. Helen was as motivated as she was optimistic. Her extensive responsibilities demanded much of her time, but she shifted her attention to the financial support of her large family. 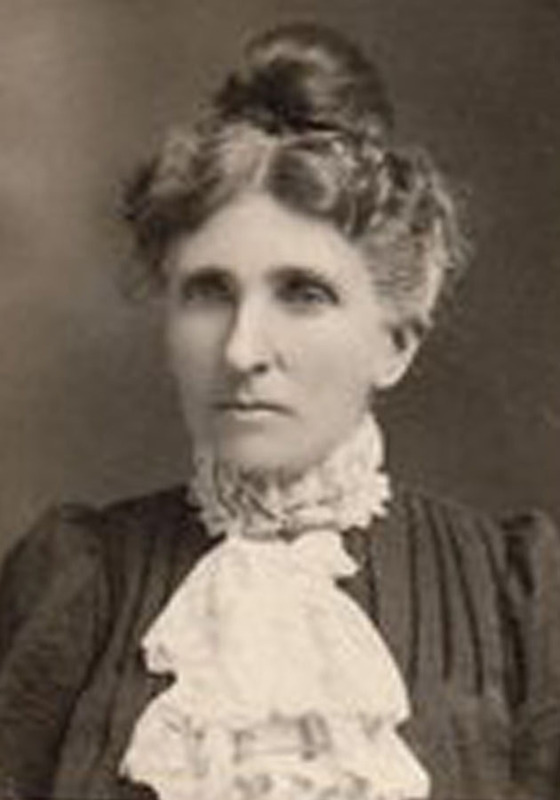 She continued to lecture, gathered and edited copy for the Kansas Tribune, wrote for the Revolution and the Agitator (later called the Woman’s Journal), was an advisor for the National Woman Suffrage Association, and wrote as a correspondent for various national and statewide publications. In addition to being one if the few women business owners of her time, Helen also stood out in her agresdive use of advertising in the local newspapers. 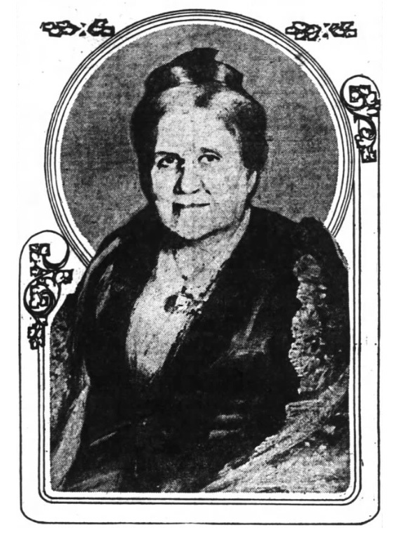 Large, front page ads such as this were often printed in the paper while she owned her piano shop. Before her marriage, Helen had been a music teacher. 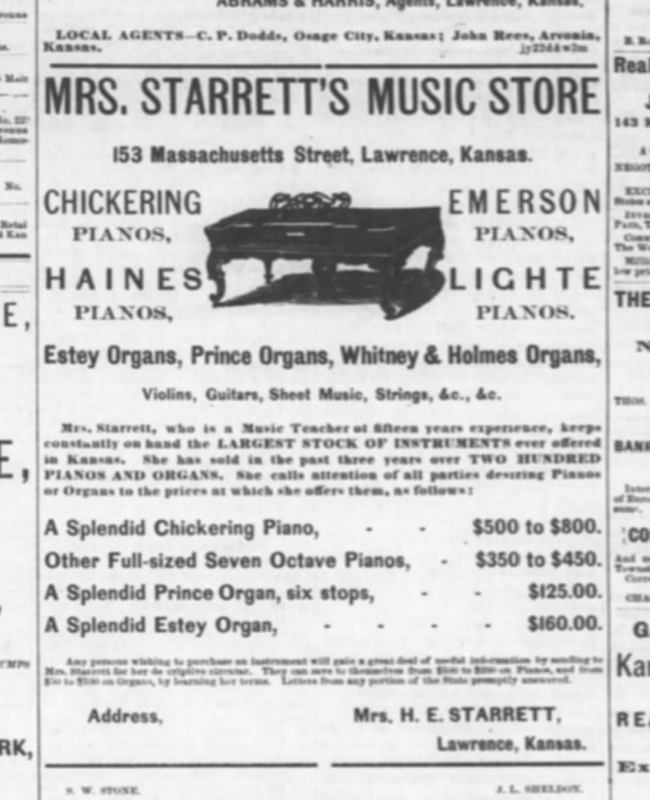 She used her music background to her advantage and in 1870 obtained a license to sell Chickering pianos at a time when women simply didn’t own their own retail businesses. She advertised her goods in numerous newspapers, and her store was known beyond the borders of their frontier town. But her time as a shopkeeper was short. She had other aspirations. For years, she had been active in literary circles, and regularly gave lectures throughout northeastern Kansas. (At the time, socially conscious college graduates lectured as a way to share information with others who may not have had a formal education.) She pursued the relationships she had formed while lecturing, and landed a job as a reporter for the St Louis Dispatch. Her youngest was still an infant, so she simply took him with her. William stayed in Lawrence to continue his legal studies and his work as a member of the Board of Regents at the State University of Kansas, but made frequent trips to St Louis. His youngest sister, Annie, stepped in to care for the children and tend to the household duties as she had done in times before. Annie loved her nieces and nephews, and they loved her like a second mother, but she had her hands full. All the Starrett children admitted that they were willful and independent children who consistently resisted her authority, played hooky from school, and were unruly, boisterous, and constantly full of energy. 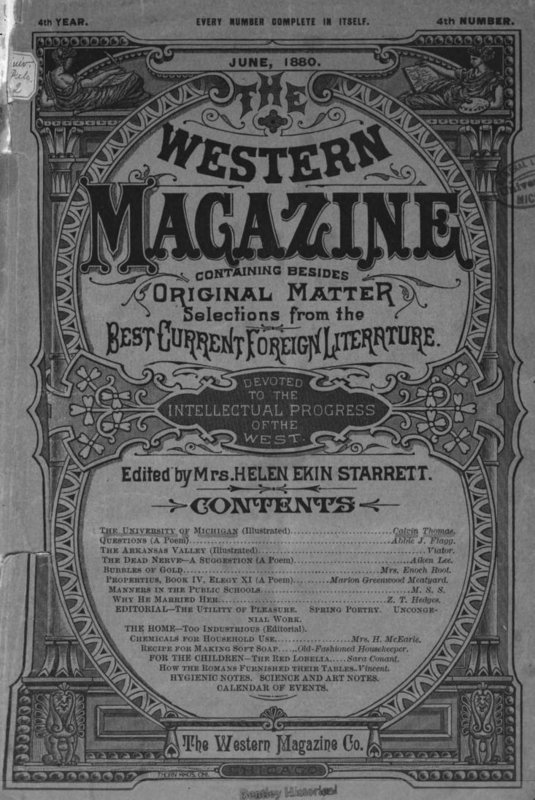 The Western Magazine, edited by Helen Ekin Starrett. The magazine was filled with original writing and fully illustrated. It was universally hailed by critics as a brilliant publication that was more than worthy of the $1 a year subscription price. The Western Magazine was headquartered in the fashionable Lakeside Building in Chicago, and Helen occupied the office that had been originally fitted for author Bret Harte. The Lakeside Building housed some of the best known publications of the times and was a very fashionable address for the magazine. While in St Louis, Helen dreamed of working for a publication where she could call the shots. In 1938, Helen’s son Paul wrote that when Joseph Pulitzer, the bought the Post, he made it his first order of business to fire the paper’s sole woman reporter. (There seems to be more to this– possibly that Pulitzer expected Helen to continue writing about “home” issues, or that he wanted her to do more “stunt reporting” rather than social science type pieces. More on stunt reporting and Helen to come!) Helen decided that this was her window of opportunity. She and William, having recently passed the bar, left the children at home with the exhausted Aunt Annie, and set off for Chicago. They would both have offices in the fashionable Lake Side Building—Helen as the editor-in-chief of the Western Monthly Magazine, and William as a lawyer in his own practice. The 1870’s were rough for Caroline. 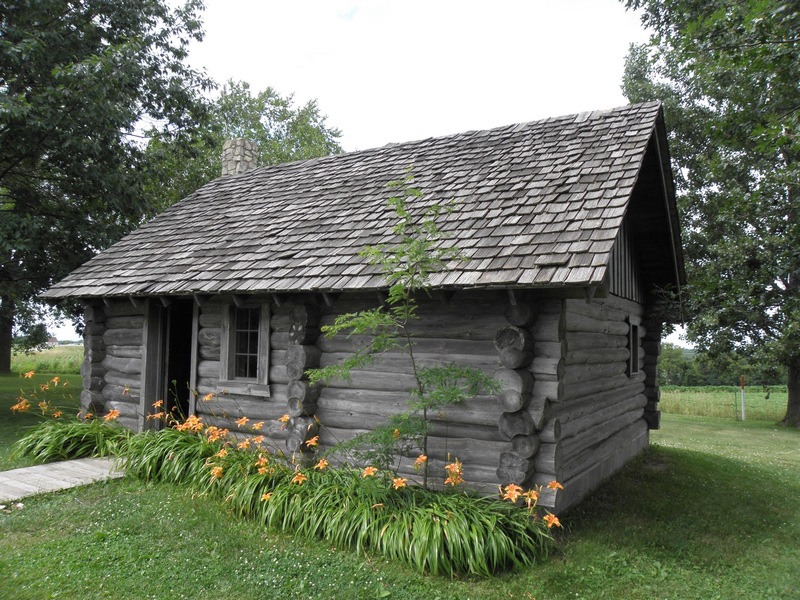 In a no-win financial situation with their property in Wisconsin and the legal situation with the Osage Diminished Reserve lands, the Ingalls family packed up and left the Kansas prairie for their old home in Pepin, Wisconsin—a three-room log cabin near the big woods. But their stay was short. By 1874, Caroline was again tasked with packing up the household for another move. The Ingalls family’s “Little House in the Big Woods,” located in Pepin, Wisconsin. From photographs, it doesn’t look much bigger than the home in Kansas, but from accounts of the homes, this house was much bigger. Photo from Wikipedia. Their plan was to briefly stay with family before heading across the frozen Lake Pepin to Minnesota. But the girls contracted scarlet fever, so illness delayed their start. Caroline kept them in bed until they couldn’t wait any longer. At the first signs of a thaw, they determined that if they didn’t leave immediately, they would miss their opportunity. Caroline bundled her girls up tightly in blankets, and sat with them in the wagon, comforting and reassuring them along the way. When they arrived on the banks of Plum Creek in the spring of 1874, near Walnut Grove, Minnesota, Caroline transformed the existing dirt, mud, and grass dugout into a cozy little home for her family. Charles immediately began building a real house and planting a wheat crop, the girls started school, and Walnut Grove was close enough for them to participate in church and community events. Caroline gave birth to a baby boy they called Freddie, and life in Minnesota was happy. Sadly, their happiness was short lived as one disaster after another befell the family. 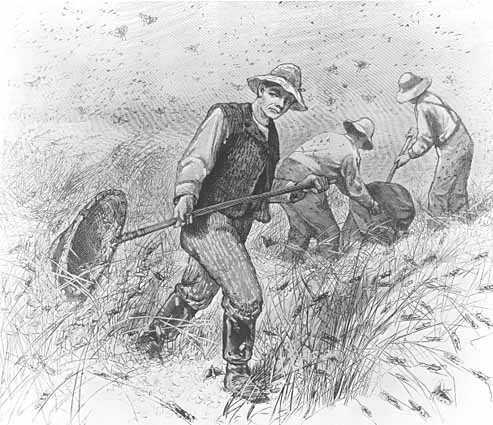 Months of backbreaking work were destroyed in an afternoon when grasshoppers infested the area and ate everything in sight. The eggs they left behind ruined any possibility of success for 1876. With no means of income, they left Minnesota with plans to manage the Masters Hotel in Burr Oak, Iowa with some friends from Walnut Grive. Once again, Caroline packed. The venture to Iowa began with heartbreak. Along the trail, nine-month old Freddie became very sick and died. Caroline’s heart must have broken as she had no other choice but to bury her baby boy along the way in a place she’d never be able to visit. The Masters Hotel in Burr Oak, Iowa. 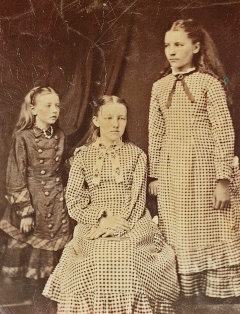 The time the Ingalls family spent in Burr Oak was completely left out of Laura Ingalls Wilder’s fictional accounts of the family’s adventures, probably because their time in Iowa was tumultuous, dangerous, and filled with adult-themed experiences. I imagine that Caroline wanted to just forget that chapter of their lives, and would’ve been happy that Laura decided to omit it altogether. Other than Baby Grace’s arrival, nothing happy seemed to have come from the Iowa Chapter. Photo: Wikipedia. But, somehow, women in Caroline’s position had a strength that defies all modern comprehension. She quickly collected her emotions and pressed on. 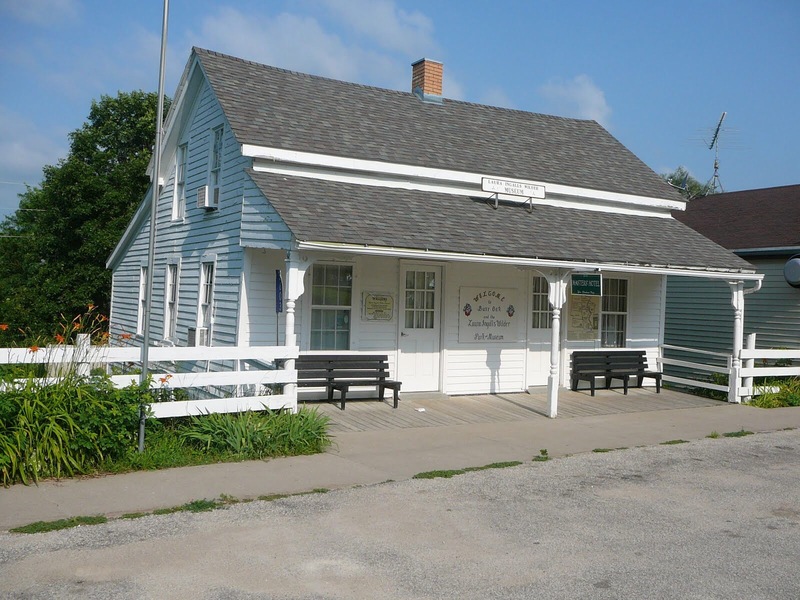 In 1876, Caroline set up housekeeping beside the Masters Hotel in Burr Oak, Iowa To Caroline’s horror, the hotel was situated next door to a saloon. For the first time, Caroline’s girls witnessed alcohol related shenanigans—fights, fires, and other activity I’m sure went unrecorded but definitely not unseen. After months of dangerous episodes, Charles and Caroline made the decision to leave the hotel business. 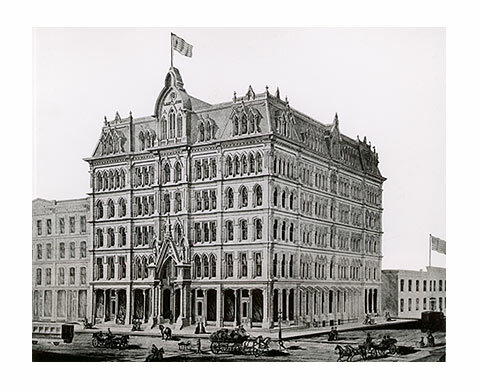 Besides being dangerous, the hotel was not profitable, so they moved above the grocery store on the other side of the saloon (not a better location) and Charles opened a grain mill. When a saloon fire nearly destroyed their home, the family rented a small brick house on the edge of town. Caroline stayed home and kept house. 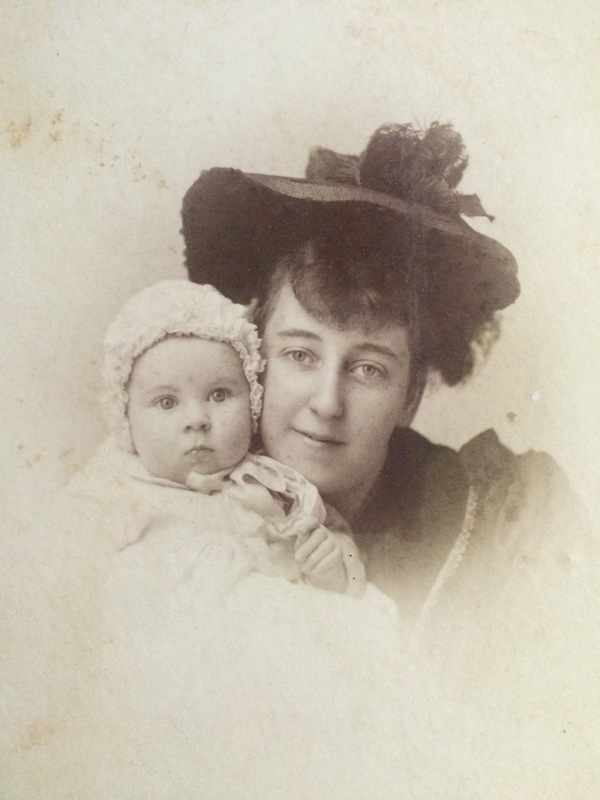 In May of 1877, she gave birth to baby Grace, and the little family was feeling optimistic. The joy of the new baby was interrupted when the town doctor’s wife created an uncomfortable situation for Caroline. Knowing their dire financial circumstances, she asked if she could adopt Laura. Caroline must’ve been horrified at the idea. Her world revolved around being a wife and a mother. Although Caroline handled it politely, the proposition must’ve made her feel deeply embarrassed and uncomfortable. As they sunk further and further into debt, Charles did something he’d never done before—and would never do again. He and Caroline hurriedly packed up their wagon and left in the dead of night. They returned to Walnut Grove, where they stayed with friends until they could buy enough land for a house. Charles rented a downtown space where he operated a butcher shop. They became active members of the community, and Charles was elected to Justice of the Peace. The Ingalls sisters. Carrie, Mary, and Laura. Photo from the American Printing House for the Blind. In April of 1879, the Redwood Gazette from Walnut Grove, Minnesota reported that Mary Ingalls was confined to bed with a severe headache. In reality, Caroline was living a mother’s worst nightmare. Mary had suffered a stroke, and would never regain her eyesight. Caroline, always the picture of the perfect wife and mother, probably kept her own suffering on the inside, remaining the pillar of strength for her family. That summer, Charles’ brother in law, Hiram Forbes, had been contracted to work on the Chicago and Northwestern Railroad. He’d sent Charles’ sister, Docia, through Walnut Grove on her way to meet him so that she could offer Charles a job with the Railroad. The salary for a bookkeeper/timekeeper/storekeeper was good, and Mary’s medical expenses were mounting. 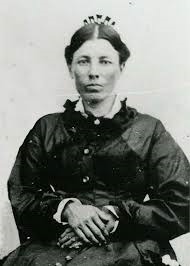 Although her fictional counterpart was reluctant, the real Caroline Ingalls was supportive of her husband’s desire to go west, so she readily agreed to the offer. Once again, she began to pack and the Ingalls family made their way to South Dakota. Next Next post: Starting All Over Again. Again. I enjoy your articles. The dugout picture is not the Ingalls’ dugout. That one caved in years ago. All that is left is a slight depression in the ground. 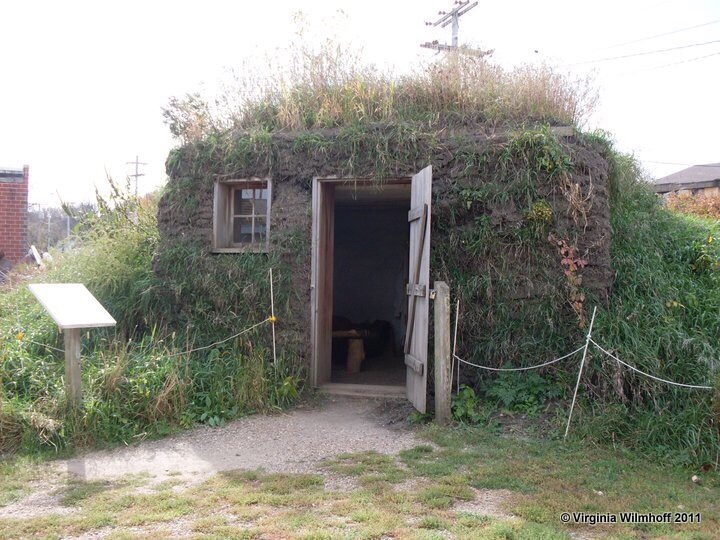 The picture you have may be from a site that has a sod house 20 miles from Walnut Grove. Thank you for the correction!!! I haven’t been there (yet) so I have to depend on the notes and descriptions of others in their travels! Hopefully I can get up there SOON! I want to go SO BAD! I want to trace the LIW sites and Helen’s locations too. Unfortunately, the Hub isn’t as into taking a vacation to Kansas! I’m trying. It’d make a great cross-post to Adventures of the Crazy Train. And, soon I am going to be writing a piece on my OTHER 2XGGmother who rode a horse through the Black Hills in the 1800s. If on;y the Hub didn’t have to work!!!! Wow, wow … wow! You are such a wonderful writer, Julie. I found your accounts of Helen’s and Carolyn’s triumphs and travails just riveting! They were both so tough, and so resourceful — such an inspiration. Thank you for keeping their stories alive so beautifully. Thanks, Heather! That REALLY means a lot to me. You have no idea how much! I have just spent two solid days on these two ladies and 1879-1889. The next decade gets even more exciting and interesting for them both because their lives go in such dramatically different directions. I haven’t even touched the next decades yet. The 1880’s have left me brain dead! Stay tuned. I literally have FOUR PAGES of single-spaced text for the 1880’s! Just thinning about it makes my eyes cross right now…..
I’m so glad you find my occasional notes encouraging, Julie — because I really do think your work is *superb. * It’s truly a privilege to read your writing, and already you’ve taught me so much! Oi. Right now it sits at about 2,700 words and very few images! I am trying to decide how to move forward!!! Slicing it into two 5-year installments is awkward. So, maybe the 1880s chapter will just be really, REALLY long!!! Think about maybe traveling solo, if possible. Your family history is fascinating. I enjoy reading it and the comparisons with the Ingalls’ history. Thank you! I think my daughter would kill me in my sleep if I hit the road without her! I just spent two solid days on Caroline and Helen in the 1880s. I can’t wait to add images and share! Thanks so much for reading. I am so excited that someone else finds them as interesting as I do.